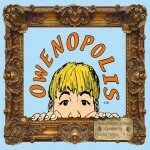 The book Owenopolis follows a day in the life of an amazing boy named Owen. Owen lives in Brooklyn, NY, in a single parent home. We get an insight into Owen’s world by following him through his day from the time he wakes up until he goes to sleep at night. His day is long and filled with exciting events that only a boy from New York can experience. Throughout the day we get to see things like the different types of transportation Owen uses to get around, his school P.S. 39, which is a real elementary school in Brooklyn, the Museum of Natural History, an exciting ride on the New York Subway, and the historic landmark rollercoaster “The Cyclone” and “The Wonder Wheel” a unique ferris wheel on Coney Island. Thomas will send a signed and personalized book to a winner of July’s special giveawas!